If you ever get to my neck of the woods and it’s one of those days where you really don’t want to be outside. 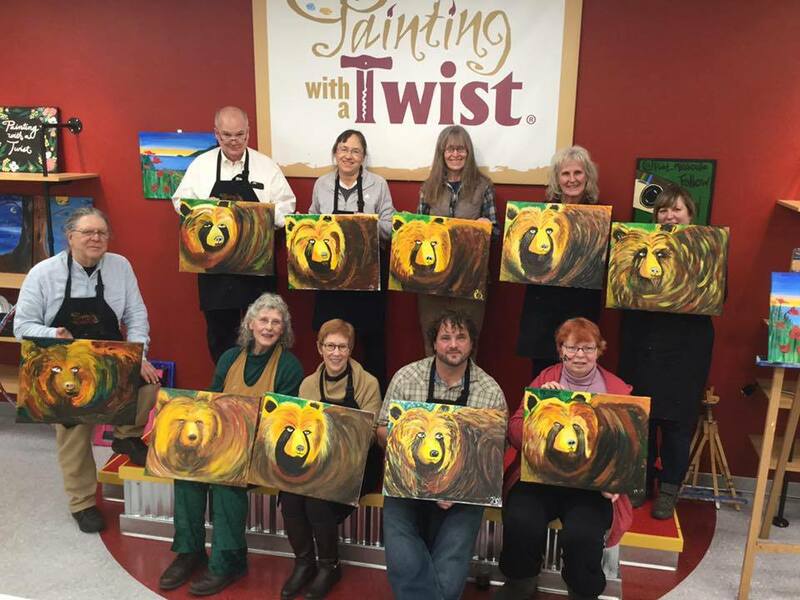 Or you have a group of friends together and you are looking for fun things in Missoula, Montana, I’ve got the place for you – it’s called Painting with a Twist! But first let me share a little back story if I may. I don’t get off of the farm that often. As I’ve mentioned before, due to my health problems, my double vision and the medications I take, I no longer drive. This leaves me dependent on the hubby’s schedule for planning anything. Oh heck – this leaves me dependent. And I hate it. Not that he is anything other than wonderful about taking me anywhere I want to go, but still. I hate having to ask all the time. Back to my story. 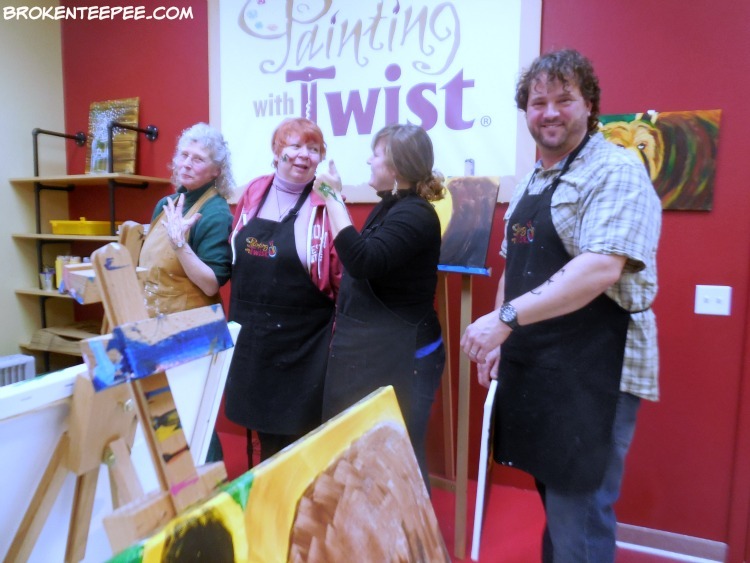 A new friend – I hadn’t met her in person yet, only online – invited me to a painting party. Janet is new to Montana. I was introduced to her by cat blogging friends when she mentioned she was coming to Missoula. We had been chatting back and forth online and we wanted to get together in person. 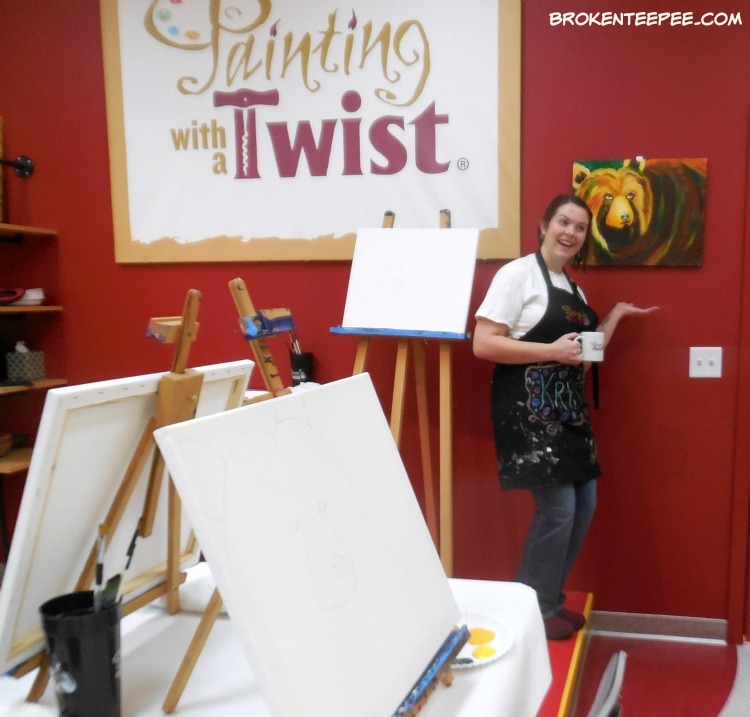 She was hosting a “Bear with Me” party at Painting with a Twist. If you haven’t heard of this unique company let me give you a quick explanation. It’s basically a painting class. You can go for the scheduled open group or you can reserve a private party. Janet was having a private event. DO NOT BE AFRAID. You do not have to have any talent – trust me I HAVE NONE. Most people bring wine. I don’t drink so I had water. Our teacher, Krysta (I think. If I have this wrong I heartily apologize. I am awful at names.) was wonderful.She was patient, encouraging and kind. 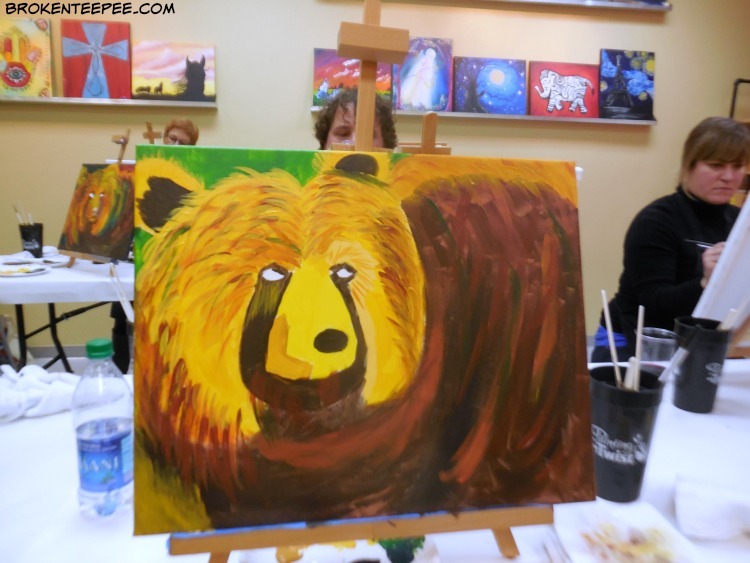 She gave excellent instructions for how to paint the bear. It is not her fault that #Iamnotanartistandneverwillbe. I hadn’t laughed like that in a long, long time. I met some great people that I hope to see again as we are talking about doing this again in March. The music playing was from the 70ies mostly so I was having serious high school flashbacks. The funniest moment of the night came when one of the other people at the party was walking around looking at everyone’s canvas. He is a very talented artist – it’s what he does. He brought his own brushes to the class. Now let me start this by saying I had been laughing at myself and making comments about my bear all night. The photo above is what it looked like when he came by. I started laughing so hard I was crying. The eyes, if you cannot tell are the only part of the canvas that I have not touched! It was hysterical. And apt. It was that kind of group and I loved it. I think everyone who was there had an equally good time. There was also a “tattoo” contest where you could either paint a temporary tattoo on yourself or have someone do it for you. The prize was a Painting with a Twist wine holder – appropriate,eh? 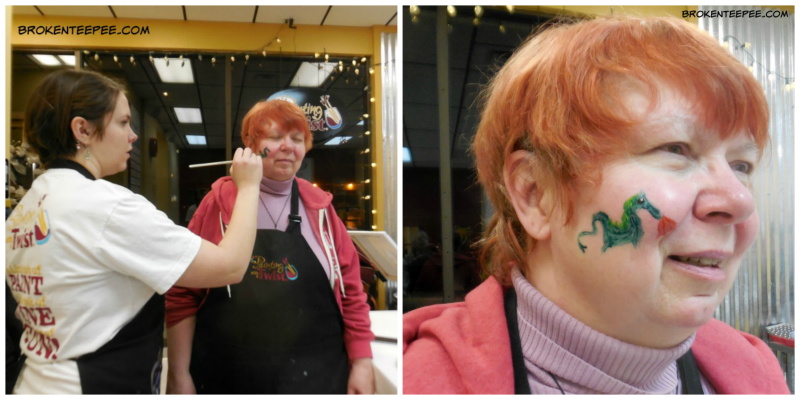 Janet opted for a dragon – cute, right? The paints used are water based acrylics so there are no worries about permanence or staining. Several participated and the winner was chosen by applause. And I can’t remember who won. That is the life of living with a bad brain. It was a fun diversion. The class was two hours and I’ll tell you, the time flew! After it was over we all posed with our new masterpieces. 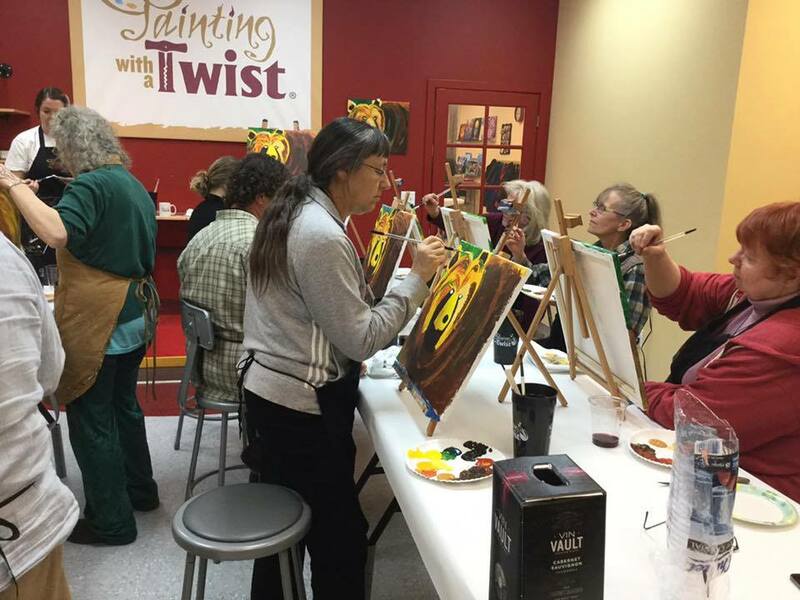 Painting with a Twist also offers a Painting Your Pet class once a month. At least that is the schedule at this time in the Missoula location. You send in a photo of your pet and their artists sketch the basics on a canvas then you come in and paint in the details. I’m going to do Pricilla! Probably not until April because of John’s schedule but won’t that be cool? I will, of course show you the resulting painting. My bear (if anyone would really recognize it as a bear if not told what it was) now sits at home. I’ve told the hubby he can hang it in the motorcycle palace. No comment on his answer. 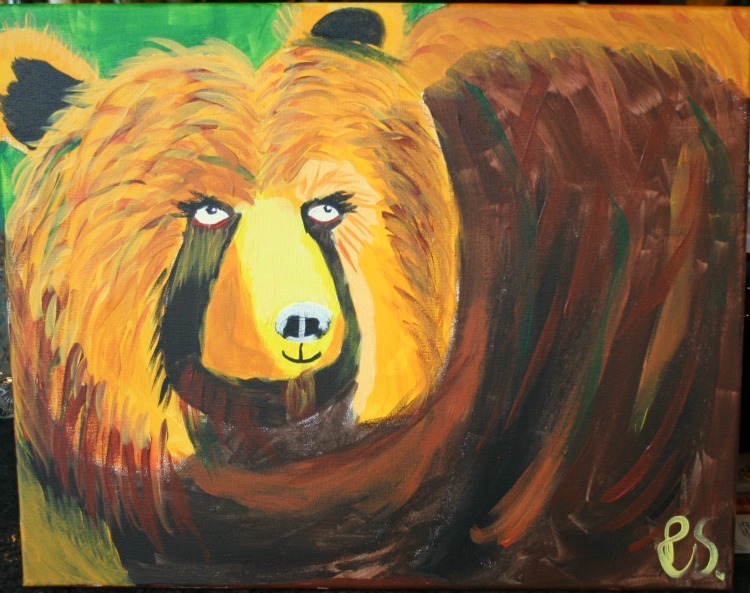 If you are looking to find fun things in Missoula or your city I highly recommend Painting with a Twist. The cost for the evening was $35 and I felt it was worth every penny.